Singapore tour package will definitely give you an insight into the modern city, but if you have a thirst for history, culture and tradition; take these tours to explore the underbelly of Singapore. 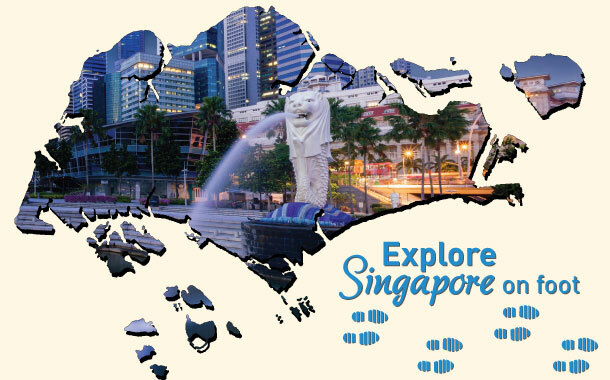 To enjoy a seamless journey, book a Singapore visa and experience Singapore like never before. Have you heard the story of how Singapore was sold for 60,000 Spanish dollars? Have you heard about the Peranakans? Do you know how British colonisation has affected contemporary Singapore? Do you know about the war that tore Singapore apart? All your answers lie in these foot-walks in the lost bylanes and corners of the modern-day Singapore. Read on to know more about these walks. Only on a tour like this you will learn how Singapore was sold to the British for 60,000 Spanish dollars. Learn how the neighbourhood got its name from a weeping tree, why it is called the ‘Muslim Quarter’ and walk through the graveyards of ancient Malay princes, Sultan Mosque and the old Royal Palace. Learn about the traditional ‘jamu medicines’. Jamu is curated from natural herbs and villagers swear by its effectiveness. This walking tour will take you through the history of colonisation of Britishers and the repercussions of a treaty singed with British East India Company. A funky story of people who broke the bank, vandals, drug racket and much more! This tour will give you the classified story of how this commercial sector was once the center of a major scandal. You will walk through Singapore's Boat Quay, Street of Mercy, Broker's Alley, Cavenagh and Elgin Bridges and visit the Asian Civilisation Museum. You can also sip in a drink at one of Singapore’s ancient pubs. Well, think of India in middle of a foreign island, a colourful concoction of garments, spices, food and temples! Little India is all about experiencing the culture of India in a land that is completely outlandish. Wear garland of flowers and pray at the oldest Hindu temples in Singapore- Sri Veeramakaliamman Temple. Sarees, mehendi artists, fruits, spices, snacks and much more - Little India is packed with best of Indian culture and flavour. Take a peak in the historic past of Singapore when Sir Stamford Raffles founded the city of Singapore at the early onset of 19th century. The tour will take you through the colonial districts of Singapore and you will see the real rustic side of Singapore that made it the city that it is now. Visit the observation deck of Supreme Court, country’s largest cathedral - St. Andrew’s Cathedral and unearth the history of Armenian Diaspora at the Armenian Church, the oldest church in Singapore. Also, get a chance to see the historic complex building of CHIJMES that houses a chapel built in Gothic style. A must-do is visiting Raffles Hotel for the famous cocktail- Singapore Sling. The Battle of Singapore or Fall of Singapore was fought when the then Empire of Japan invaded the Allied stronghold of Singapore. Learn about the war that tore apart the British military and made thousands of British, Indian and Australian troops prisoners of war (PoW). Visit the site of Sook Ching Massacre at Changi Village and Changi Beach; walk outside the Japanese PoW WWII internment camps at Selarang Barracks. Behold the sight of the replica of Johore Batteries, a set of 3 large 15-inch naval guns which were installed by the British Empire in Changi. Pay your tribute to the warriors at the Old Changi Prison and visit the Changi Museum and Changi Chapel. Just like the Changi WWII War Trail, this trail will walk you through the 1942 Battle of Singapore. You can also opt for a coach-ride which will take you through the fire of battle and the fog of war that led to the defeat of Singapore in WWII. Commemorate the war heroes at Kranji War Cemetery which is a part of the Commonwealth War Graves. You will walk the site of Fort Pasir Panjang and see Labrador Battery, a 6-inch gun battery. A massive massacre that took place in Alexandra Hospital is also a must visit place. Singapore has an eclectic blend of history and culture. On this walk, you will uncover a whole new world of China shrouded in the modern metropolitan culture. This amazing walk will cover Haw Par Villa and take you through the Eight Immortals, Tiger’s Den and Ten Courts of Hell. Tales right from Chinese mythology and their folklore will keep you engrossed throughout the walk. Make your visit to Chinatown more meaningful by learning about the Chinese rituals and culture. At Chinatown, you will enter a realm of Chinese lifestyle where smells of Chinese tea, ginseng and herbal eggs envelope the air. Get enchanted by the architecture at Thien Hock Kheng, the oldest Hokkien-Chinese temple in Singapore and get soaked in the story of how Ann Siang Hill turned into an artistic neighbourhood from all the riches. Who are Peranakans? They are the descendants of immigrants from China from 15th to 17th century. Learn all about their tradition and heritage on this walk. The trail will encircle the Joo Chiat and Katong districts of Singapore. Rumah Bebe stocked with Peranakan artefacts will give you an insight into their elaborate woodcarvings, luxuriant dresses embellished with intricate embroidery and bead-word. Give your taste buds a treat by trying traditional Peranakan cuisine at Peranakan Inn on East Coast Road. Also, don’t miss to order the famous fish head assam curry and nasi goreng buah keluak for an authentic Peranakan experience. Chilli Padi at Joo Chiat Place is equally reminiscent of their culture. Start the walk from Killiney Road and watch-out for Killiney Kopitiam where you will get the best half-boiled egg and kaya toast. Cross the 2nd Jewish Synagogue, Chesed-El Synagogue to arrive at the Tank Road. You will get a chance to see Church of the Sacred Heart, Ngee Ann Cultural Centre and Ngee Ann Kongsi Heritage Centre. Pass the Park Mall - a furniture mall, The Legends Fort Canning Park, The Café and the only remaining sally port of the fortress. To know more about Singapore and places to see and things to do, kindly go through our Singapore tour packages.